Mount Olive, NC (RestaurantNews.com) Hwy 55 Burgers, Shakes & Fries, the highly and widely celebrated retro family-friendly diner and the Official Restaurant of National Hamburger Day is ready to celebrate its favorite holiday by offering guests half off all burger combos from 5 pm to close on Monday, May 28. More than 27 years ago, Hwy 55 president Kenney Moore decided to put his commitment to authentic hospitality and the world’s best burgers under one roof. Moore originally named his restaurant Andy’s Cheesesteaks and Cheeseburgers, and he even flipped every burger himself for the first two years. Once a well-kept secret in tiny but vibrant Mount Olive, North Carolina, Hwy 55 now operates 137 restaurants and has sold the rights to more than 1,000 franchise locations around the world. Hwy 55 has also signed franchise area agreements for Texas, West Virginia, Louisiana, Kentucky and southern Indiana and Virginia in the past year. The brand plans to open approximately 25 more locations in 2018. 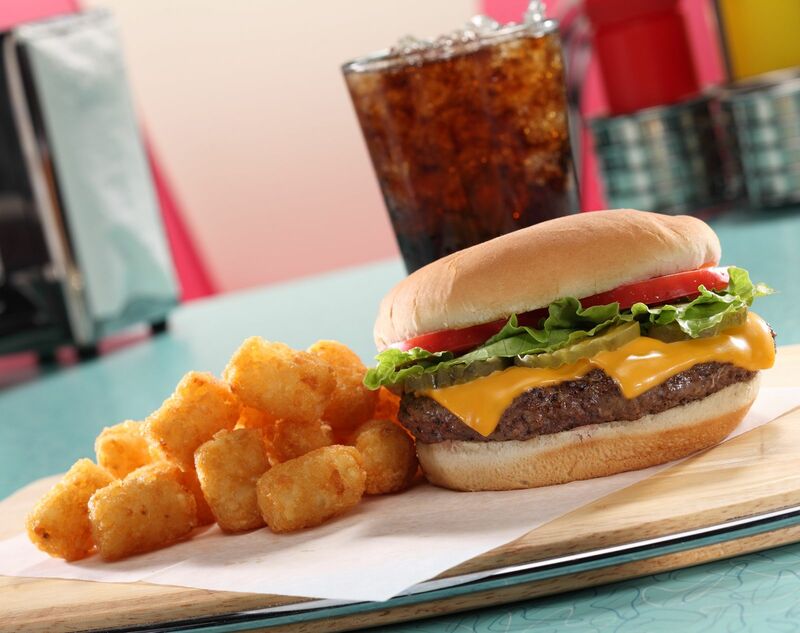 Hwy 55, which is also the official restaurant of National Cheeseburger Day, has not only resonated well with the burger-loving public, the restaurant and franchising industries have taken notice as well. Hwy 55 won BurgerBusiness.com’s “Best Burger” in 2012 and in 2014, Franchise Business Review named Hwy 55 one of the best restaurant franchises in the country. The brand also was recently named a top 500 franchise in the United States by Entrepreneur magazine for the second consecutive year and a “Next 20” restaurant brand by Nation’s Restaurant News. The industry darling will also host the Hwy 55 Burgers, Shakes & Fries World Hamburger Eating Championship, and the only hamburger eating competition recognized by All Pro Eating. This year, the event will be held at the Crabtree Valley Mall in Raleigh, N.C. on Saturday, June 2, at noon. It is the company’s second national foray into full-on competitive eating although the brand daily for years has featured the 55 Challenge. In the 55 Challenge, guests receive a 55-ounce burger with seven patties and at least four trimmings, fries and 24-ounce drink. If guests can consume it all in 30 minutes, it’s free and Hwy 55 will put the guests name on their website for bragging rights. If a guest is unable to finish the meal in 30 minutes, it costs $29.99. Hwy 55, the official restaurant of National Hamburger Day and National Cheeseburger Day, is a retro-themed diner that features fresh, never-frozen hand-pattied burgers, house-made frozen custard, and other classic favorites in a unique open-kitchen setting. Founded in Goldsboro, North Carolina in 1991, Hwy 55 reflects founder Kenney Moore’s commitment to authentic hospitality, incredible service and the world’s best burgers. As the Hwy 55 has grown, the industry has taken notice, with the brand winning BurgerBusiness.com‘s “Best Burger” in 2012. In 2016, for the second consecutive year, Hwy 55 was named a top 500 franchise in the United States for by Entrepreneur magazine. It has also been acknowledged by Franchise Business Review as a top restaurant franchise in the country and by Nation’s Restaurant News as a “Next 20” restaurant brand. Hwy 55 currently has 137 locations in 13 states. Fans are invited to like Hwy 55 at https://www.facebook.com/Hwy55burgers or follow us at https://twitter.com/hwy55burgers. For more information, visit https://www.hwy55.com.